On Tuesday the 25th of December, let us take the hassle out of hosting family and friends for lunch. 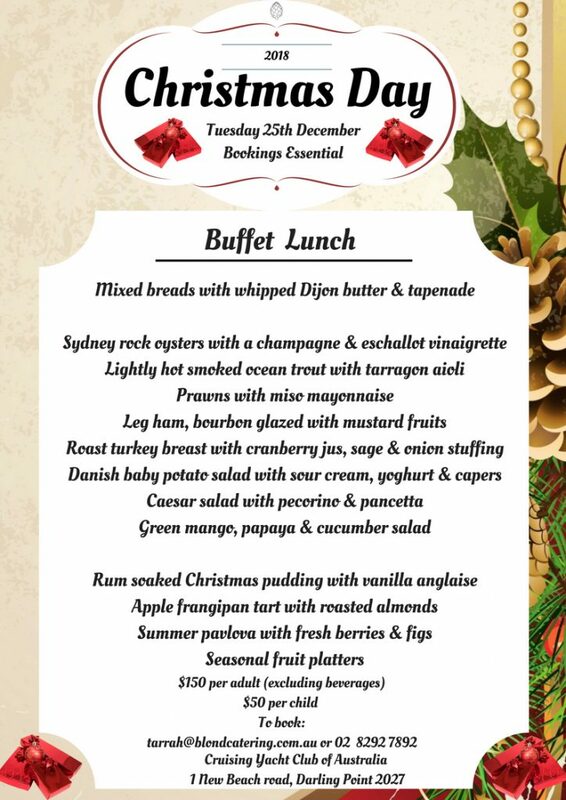 With stunning waterfront views over Rushcutters Bay and exclusive use of the private balconies of the CYCA – home of the Rolex Sydney Hobart Yacht Race, there is no better place to enjoy a Christmas Day lunch with your friends, family or colleagues. With a delicious buffet lunch all provided by Australia’s Venue Caterer of the Year, Blond Catering, you and your guests are sure to dine in style! Our Chefs have created a Festive Feast for all to share. Enjoy a delicious buffet lunch including traditional festive dishes, market fresh seafood and indulgent desserts, and relax to the tinkle of yacht rigging as the boats sway at their moorings. Please email tarrah@blondcatering.com.au for a booking form. We look forward to welcoming you to the Cruising Yacht Club and celebrating Christmas with you.